I'm excited to taste this wine because last time I visited Napa I was lucky enough to taste the 2008 Napa Cab with Thomas Rivers Brown up at Outpost on Howell Mountain, and it turned out to be the best wine I experienced on the entire trip. (Tasted 100+ wines that week). 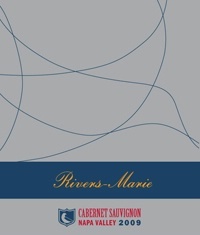 The 2009 Rivers Marie Cabernet is a 12 barrel blend of fruit sourced from various vineyards and AVA's : (25% Oakville, 42% St Helena and 33% Spring Mountain from the Baconbrook Vineyard.) It was aged in 50% new French Oak. The color of the wine is indicative of it's ultra-young state and expresses a brilliant dark purple hue along the edges of the glass and a black core. On the nose the wine is still pretty tight, but does show some very nice black currant and cassis notes, as well as secondary aromas of espresso bean, cedar, black licorice, mineral/crushed stones, and menthol. It's quite obvious that the wine is pretty wound-up and needs plenty of cellar time to release it's full range of complexity on the bouquet.